Takaful is an insurance concept that has been in use for over 1400 years. Grounded in Islamic Muamalat, observing the rules and regulation of Shariah, the Takaful system is based on mutual cooperation, responsibility, protection and assistance. The fundamentals are based on the Holy Quran and the sayings of Prophet Muhammad S.A.W. The Takaful system stresses the spirit of cooperation and joint-responsibility among participants. Participants enjoy monetary benefits through the Takaful plan itself and “benefits” through the spiritual sense through the act of Tabarru (donation), participants receive God’s grace and blessings in the Hereafter. But what if you are not a Muslim? Well, the good part is that Takaful does not differentiate color or creed. Everyone can use Takaful, religious beliefs are not relevant, and everyone can benefit the satisfaction of helping people. 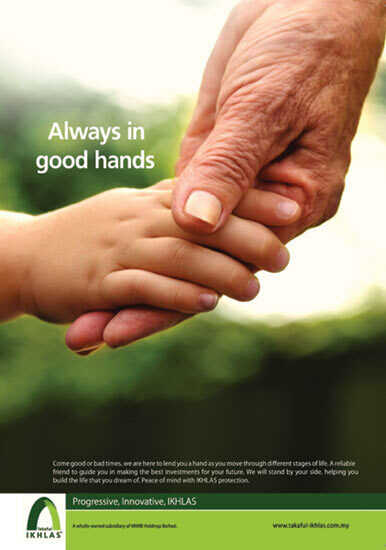 Takaful Ikhlas is committed to providing great Family and General protection. They have the knowledge to assist customers on every budget. The family protection products are focused on savings or investment-linked plans and mortgage protection plans. They have a comprehensive product range to meet the needs of their customers. Takaful Ikhlas supports: Point of Sales System (I-POS), e-IKHLAS (a transaction mode that will allow customers to purchase motor policy online, easily), e-Non Motor, e-zi Claim Drive In, Electronic Claims Estimation System, Bantuan Ikhlas 24 Hours Roadside Assistance and e-Covernote. Known in the market as a dynamic brand, Takaful Ikhlas was incorporated in 2002 and has over ten years of experience and slightly over 1.8 million participants. That can mean only one thing: professionalism. With over 5,000 agency personnel, brokers, financial institutions, motor franchise holders, co-operatives and Islamic bodies, the company has 12 branches in various locations, such as: Selangor, Sungai Petani, Kota Bahru, Johor Bharu, Kuching, Kota Kinabalu, Melaka, Kuantan, Ipoh, Terengganu, Putrajaya and Seremban. Takaful Ikhlas use of technology is deliberate and well thought out. They have invested considerably in this area of support, so its business partners and participants can be served with effectiveness and efficiency. Company`s investment in technology also covers the integration of many back and front-end processes. Takaful Ikhlas was among the first to utilise the e-Cover Note System and new motor takaful purchases, called e-IKHLAS. The 4 core values for Takaful Ikhlas known as IQRA. “I” stands for IKHLAS values (Fatanah, Amanah, Siddiq, Tabligh), “I” stands for quality (People, System, Strategy, Sales), “R” stands for results driven (Soul and Spirit) and “A” stands for Attitude (Right mind set). Takaful Ikhlas ensures good relations with their clients. Using the IKHLAS system, they care to make customer interaction more personalized. The IKHLAS care system is a unique and personalized system that allows clients to easily contact customer service online or telephone. Specialized operators offer immediate consultation to help resolve customer issues. Customers are able to submit feedback positive and negative which enables IKHLAS to improve services. The main objective of Takaful Ikhlas is to be the preferred provider of Islamic financial protection services. They say that they will leave no stone unturned to achieve this.